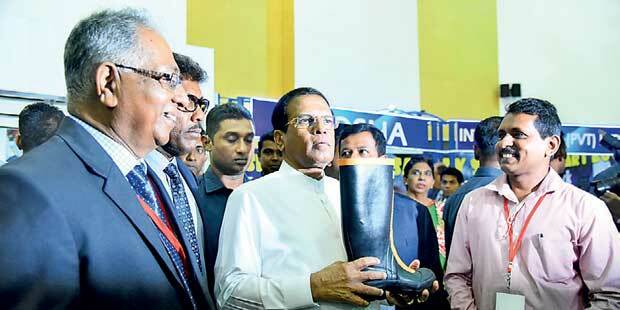 The Footwear and Leather Fair 2018, organised by the Sri Lanka Footwear and Leather Products Manufacturers Association in collaboration with the Ministry of Industry and Commerce, Industrial Development Board of Ceylon and Sri Lanka Export Development Board, has opened its doors to the general public. The fair is open from February 2nd to 4th from 10.00 a.m. to 9.00 p.m. and is housed under the halls ‘A’, ‘B’, ‘C’, and ‘E’ of the BMICH. The fair has about 230 stalls including foreign participants- Indian, Pakistani and Chinese, and offers an opportunity to local customers to view and purchase latest designs of export quality footwear and leather products at reasonable prices. The inauguration of the fair was graced by the presence of President Maithripala Sirisena, Industry and Commerce Minister Rishad Bathiudeen and International Trade State Minister Sujeewa Senasinghe. Recognising the footwear and leather industry as a potential industry to be developed for exports, the government has facilitated the industry with several initiatives. The local industry is almost reaching the saturating point where exports are essential for the sustainability of the industry. With a view to broad base the export ready footwear and leather industry, and to create awareness on the capabilities of the industry locally and internationally, the Sri Lanka Export Development Board (EDB) together with other stakeholders organised Sri Lanka’s first ever Footwear and Leather Fair in 2007. The objectives of this fair were to strengthen and sustain the image of the industry, promote Sri Lankan export capabilities among international buyers, provide opportunities for SMEs to improve their talents and capabilities to become export ready companies and to upgrade technological capabilities of SMEs and encourage them to move into manufacturing value added products to cater to the international market. Considering the success of the 2007 fair and the importance of continuing the fair which has achieved the set objectives, the Footwear and Leather Fair was held annually. The fair which was held for nine consecutive years has contributed immensely in creating awareness of the Sri Lankan footwear and leather industry locally and internationally. President Maithripala Sirisena says it is vital to work in accordance with a policy based on the local industries in the process of strengthening the national economy. The President pointed out that proper management of the resources in a country as well as the investments made from the use of those resources was fundamental to develop a country. The President made these remarks participating in the opening ceremony of the International Footwear & Leather Fair 2018. President Sirisena further said that even though we needed foreign investments for the development of the country, we should obtain all those foreign investments in a way which would not harm our local industries. He also emphasized that he would not allow any room to weaken the local industries due to the influences of foreign investments. The President said that nevertheless we could not be satisfied about the priority given to the local industries within the country over the past two decades and further said that a pleasant environment for our export market failed to emerge over the past 15 to 20 years as a result of giving lack of priority for the industry. President Sirisena also stressed the importance of strengthening all local industries in finding solutions for economic difficulties and poverty alleviation and further said that the government will intervene as a policy to find solutions for all the issues faced by them when doing their business while taking steps to encourage all the persons who are engaged in local industries as well as to provide necessary resources and reliefs for them. This exhibition is organized annually by the Sri Lanka Footwear and Leather Products Manufacturers Association in collaboration with the Ministry of Industries, Industrial Development Board of Ceylon and the Sri Lanka Export Development Board with the objectives of promoting and giving proper recognition to the industry, unveiling hidden talents and capabilities of the SME’s, identifying the most creative and skilled manufacturers to be developed as potential exporters and linking SMEs to large scale manufacturers. Exhibitors will include manufacturers, exporters and suppliers of footwear raw material, machinery, chemicals, leather goods, components and accessories, travel goods and other related services with the local companies and foreign companies exhibiting their products in 230 stalls at the fair. I am looking many company for distribution.